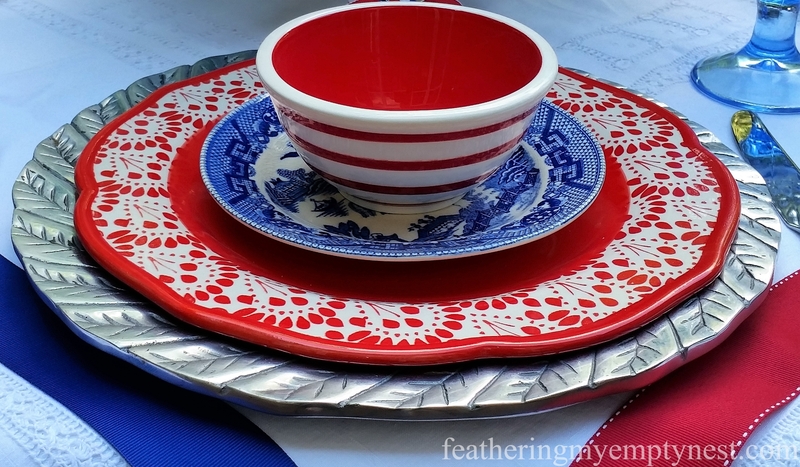 The patriotic bunting that festoons the porch railings of historic homes on the 4th of July always seems so old-timey and charming that when I saw all this red, white, and blue glory at Hobby Lobby, I knew that it would be coming home with me. Unfortunately, I do not have a historic home, but I could envision these swags of Americana hanging on the railing around my back deck, providing a perfect backdrop for an Old-Fashioned 4th of July Tablescape. In keeping with the nostalgic theme, I layered my outdoor table with two different white vintage tablecloths. I liked the way it looked, but I felt that it would look better with more color, and I wished I that had a red, white, and blue tablecloth. Since I didn’t have one, I used one of my favorite decorating-on-the-cheap items: ribbon. I have been collecting ribbon for a long time, and I have a ton of it. I come by this addiction naturally, as my grandmother had a similar ribbon obsession. I know this because when she died, I found a huge box of grosgrain, satin, and paper treasure in her basement. Diving into my treasure trove, I pulled out several spools of red and blue ribbon. I then placed them in a criss-cross pattern on the table and voilá; I had a colorful tablecloth. 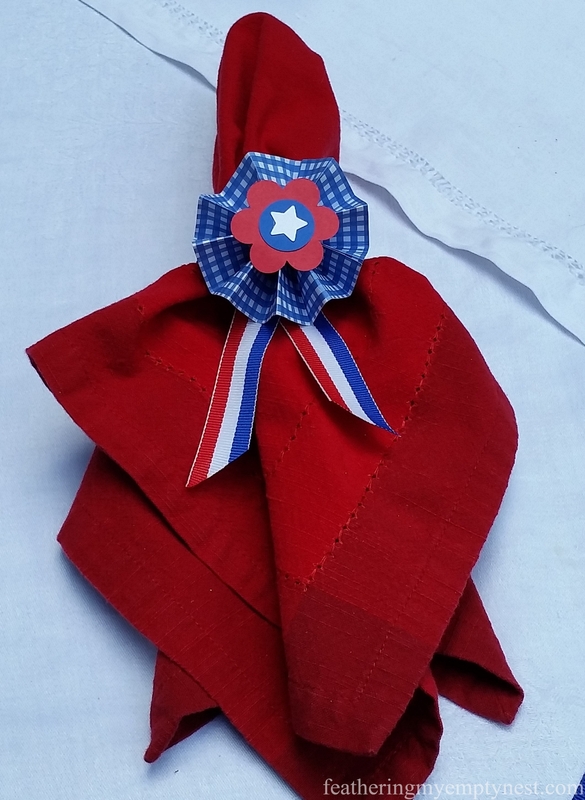 My plain red napkins were not cutting it, so I decided to zhush them up by displaying them in patriotic rosette napkin rings that I made using craft paper, plastic shower curtain rings, and you guessed it — more ribbon. Cut a 1 1/2″ x 12″ strip of scrapbook paper and fold it in 1/4″ accordion folds. Join ends together and glue seam. Flatten out the circle and hold together to make a tight rosette. Glue punched out circles to the front and back of the rosette to keep it together and provide stability. Glue additional smaller punched circle and star to the front to decorate. Hot glue 2 3″ pieces of red, white, and blue ribbon to the back of the rosette. Place a drop of hot glue on the shower curtain ring and adhere the end of a 12″ piece of blue ribbon. Wrap the ribbon around the ring, pulling taught as you go until the ring is covered and hot glue the end in place. Hot glue rosette to the ribbon covered shower curtain ring. For the table setting, I used a very eclectic and strangely, multi-national (given my Americana theme) mix of dishware. I first set my table with heavy pewter chargers that my mother bought years ago in Mexico. I then placed red “Betsy” Pioneer Woman dinner plates on top of the chargers, followed by antique Japanese Blue Willow bread and butter plates. To complete my plate-a-palooza, I placed small red and white striped berry bowls from Michaels on top of the whole shebang. Blue glass hobnail goblets and my everyday stainless cutlery round out the place setting. For additional vintage charm, I pulled out two blue transferware pitchers, the larger of which is an antique English lemonade pitcher. I also used two large transferware platters which serve as the bases for candles in hurricanes. Not being able to leave well enough alone, I adorned the bottoms of the hurricanes with wreaths of red dyed, dried flowers. 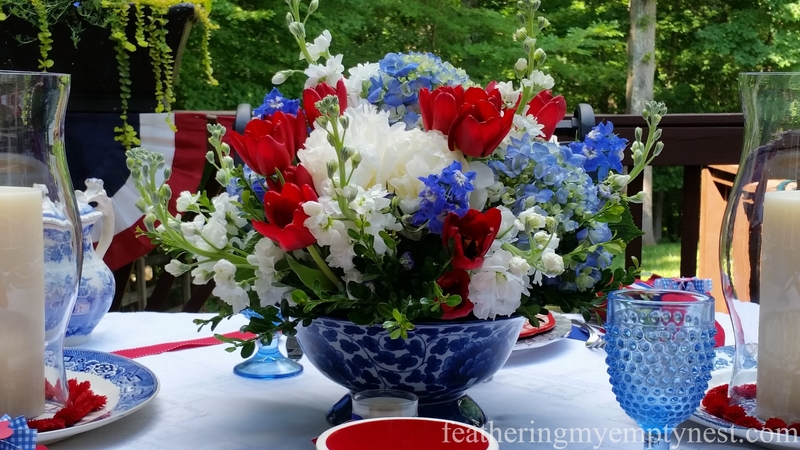 For a floral arrangement, I used a blue and white footed Chinese bowl filled with red, white, and blue flowers–red tulips, blue hydrangeas and delphiniums, and white peonies and stock. To top it off and just to gild the patriotic lily, I then added three American flags. 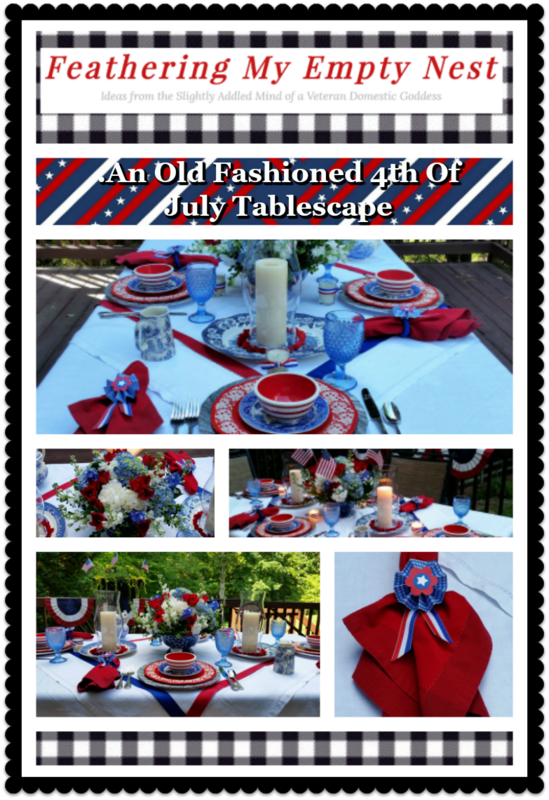 As I started detailing the items that I used for my Old-Fashioned 4th of July Tablescape, I was dismayed by the fact that most of the pieces are not American at all but rather, they are from all over the world. But then I realized that America is, and always has been, a melting pot and that bringing different people, or in this case, plates together to make something new and unique is a quintessentially American idea. 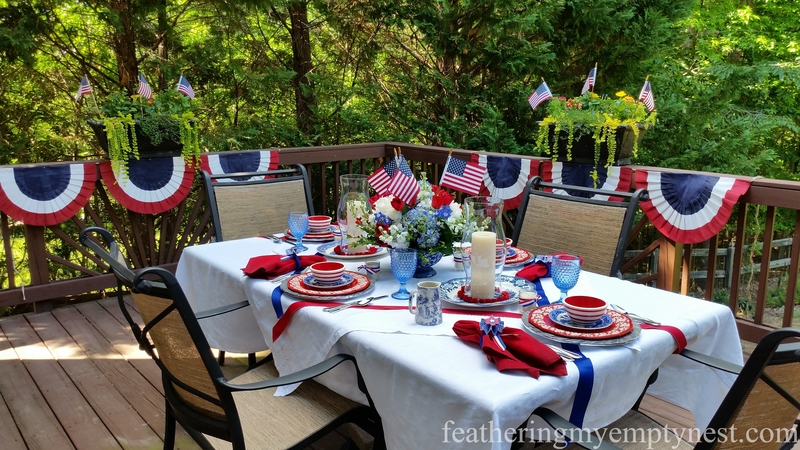 Having made my peace with my international American 4th of July table, I can’t wait to sit on the deck, sip lemonade, eat fried chicken, and watch the fireworks. Wow, what a gorgeous table! 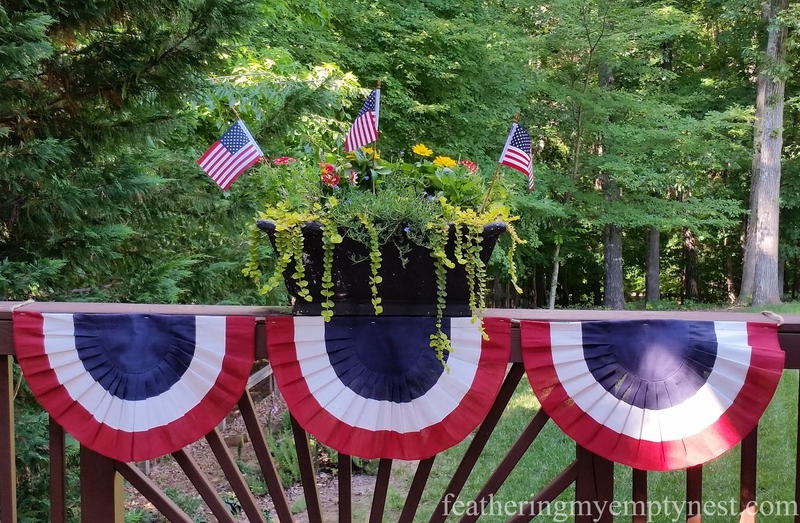 I am definitely in need of a dose of patriotism so the holiday is coming up just in time and I will definitely be stealing some of these ideas for my celebration! Beautiful dishes and I love the layers. Thank you so much. I really appreciate you taking the time to comment. What a festive setting! I like all the elements you used, particularly the variety of unexpected sources. Quintessentially American indeed! 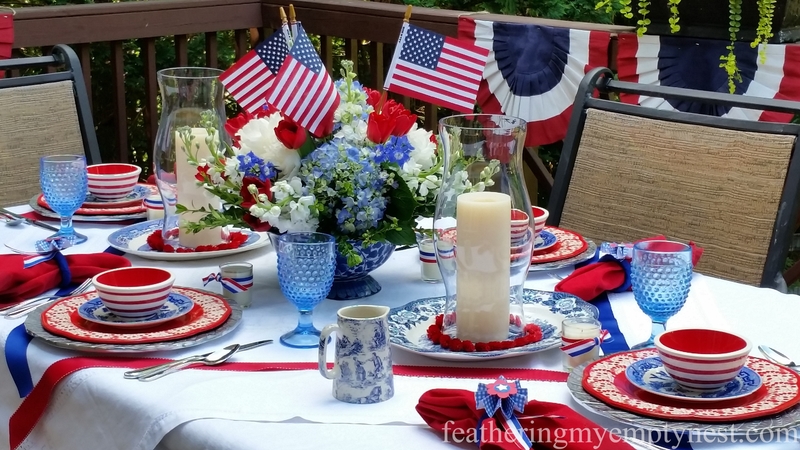 Thank you so much for taking the time to comment on my 4th of July Tablescape post. Happy 4th! What a perfectly patriotic table. I love how you improvised with the ribbon and the napkin rings are so cute. This is so pretty in all of its red, white, and blue! 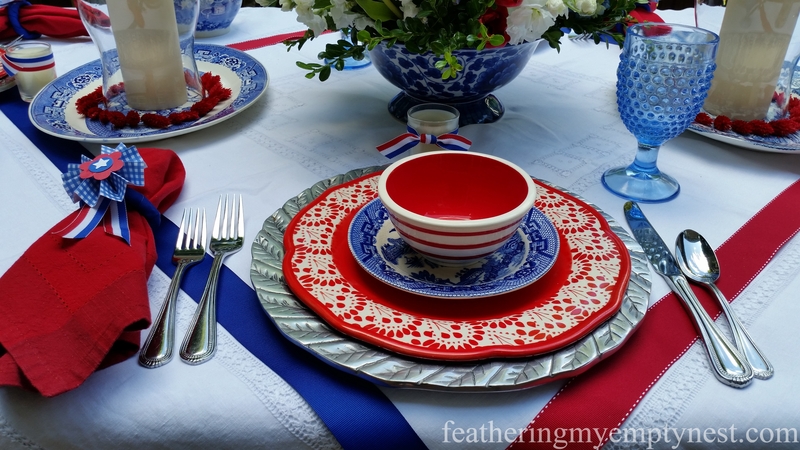 Thank you so much for your kind comment on my 4th of July Tablescape. I really appreciate it. 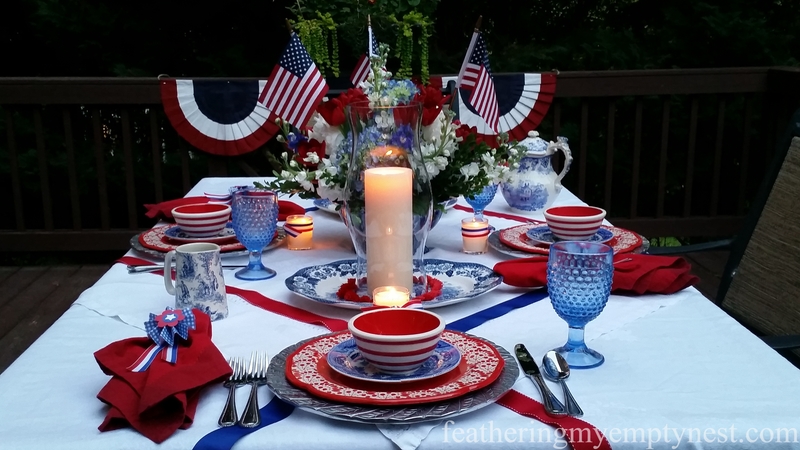 Such a great patriotic tablescape! Your centerpiece is gorgeous! Thank you so much for your kind comment on my tablescape. I really appreciate you taking the time to visit my blog. I love your tablescape! The red, white and blue is perfect! 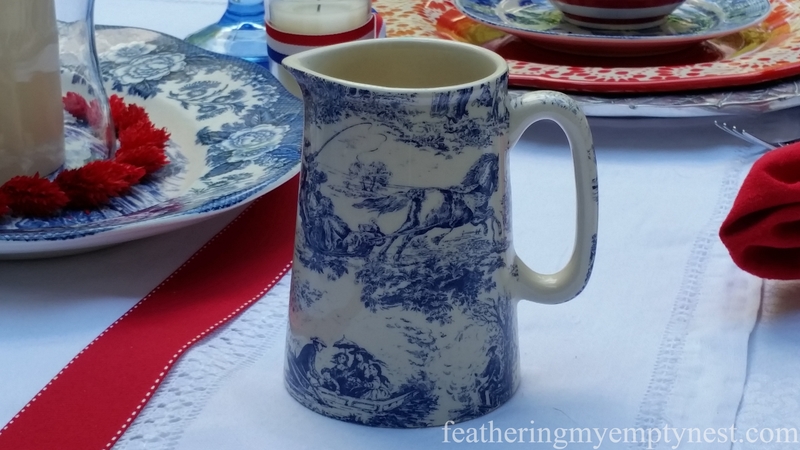 I especially love the transferware pitchers! Thank you so much for your comment on my tablescape. Happy 4th! 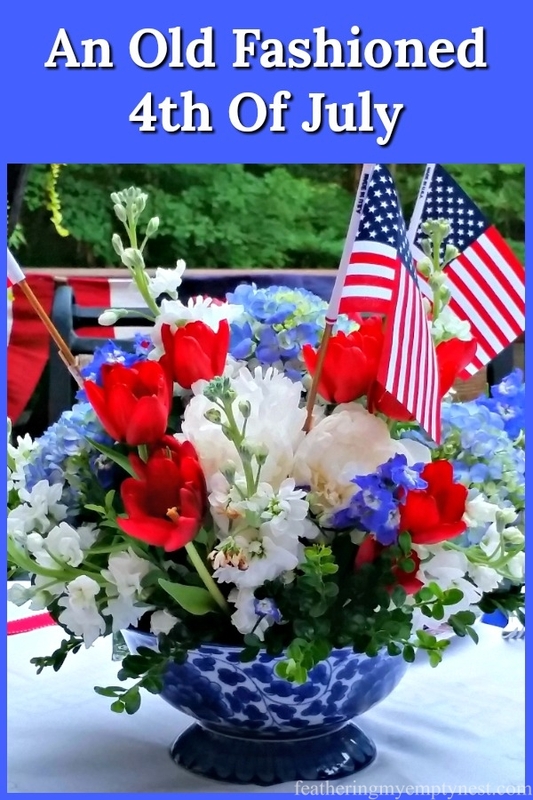 Thank you so much for taking the time to visit my blog and comment on my 4th of July post. I very much appreciate it. 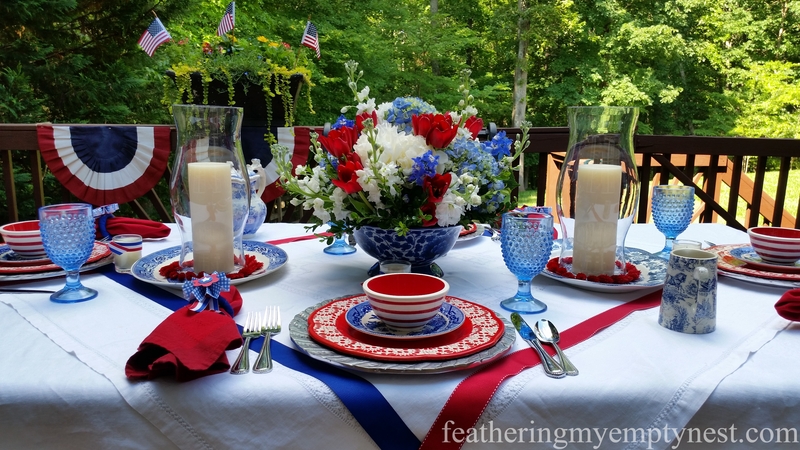 Such a lovely, colorful and Patriotic table, love it!! and your napkins rings are so cute…..they were the perfect addition. and Have a lovely 4th of July! Thanks so much. I hope you have a happy 4th of July as well. 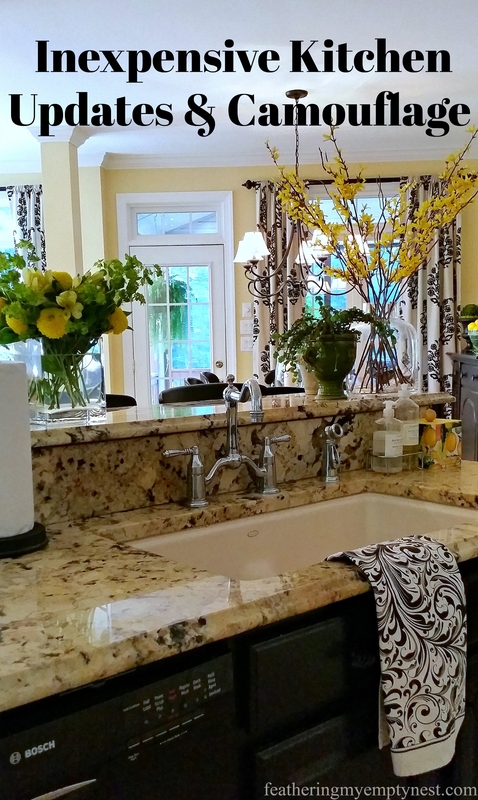 Beautiful, and the centerpiece is perfection! Thanks so much. Happy 4th! 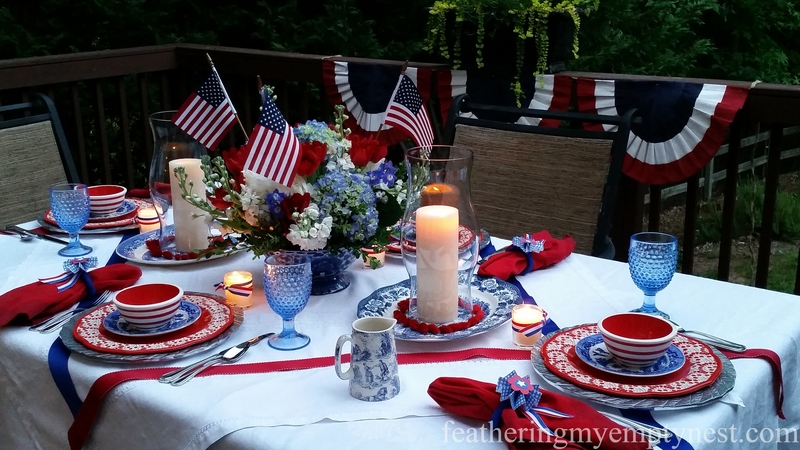 This is such a gorgeous, patriotic tablescape. I love your flowers, too. Creating an eclectic look with the different red/white/blue dishes is very effective. Beautiful! Thanks so much for taking the time to comment. I very much appreciate it and I hope you have a great 4th. 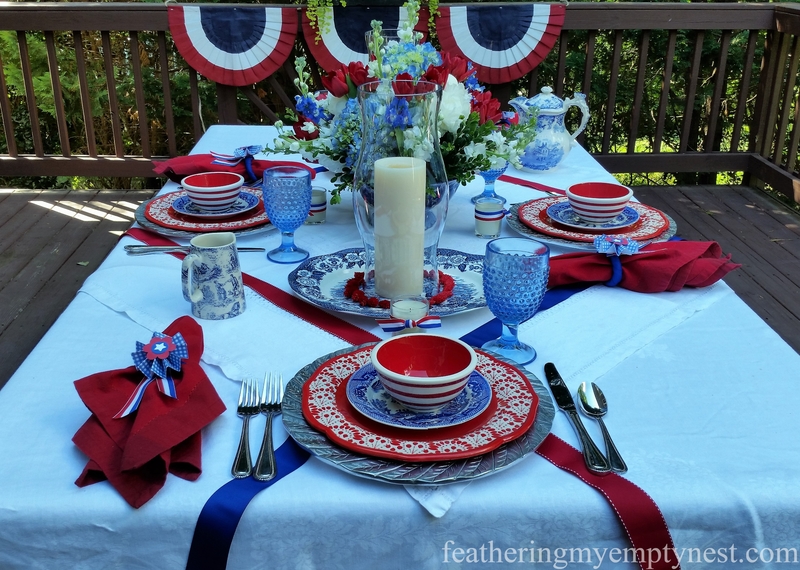 Your table is so beautiful and so Patriotic and I love everything I saw from the napkins holders to the beautiful table cloth and all your wonderful table setting that is one party I would love to be there at please keep your beautiful ideas a coming and hope to see more. Thanks so much for your kind comment on my tablescape. I hope you have a happy 4th! That is amazing. I would never look at that table and think you made it from stuff you already had in your house I love the ribbon – really “amps-up” the plain table cloth. And your dishes and how they go together is so lovely. Beautiful! Thank you for your kind comment on my post. Happy 4th! Beautiful! 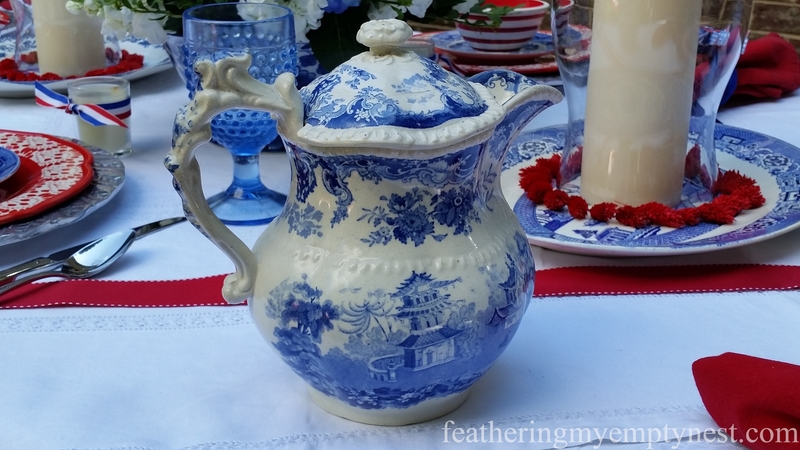 Love your transferware pieces that you used. It reminded me that I need to use mine for this seasonal holiday. Happy 4th to you! Thank you so much for taking the time to comment. 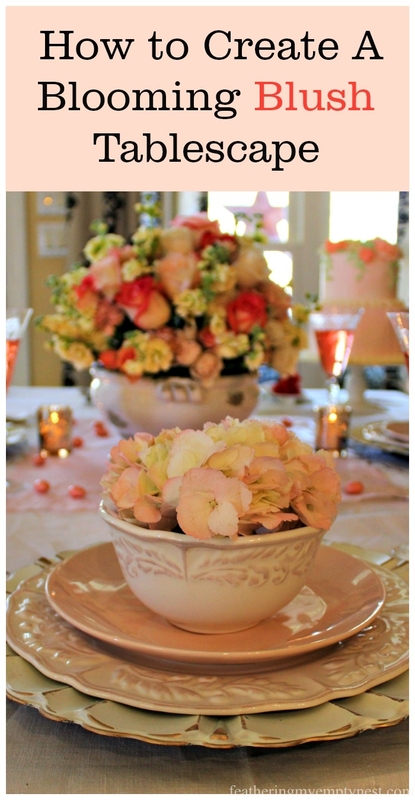 It is surprising how well transferware can be incorporated into many different tablescapes. You should definitely pull yours out and use it. I hope you have a Happy 4th as well. Thank you so much for your kind comments about my post. Happy 4th of July! Your table looks wonderful! You were so creative to make a design across the tablecloth using ribbons. Thanks for linking up with Merry Monday this week. Thank you so much for your kind comment about my post. I hope you have a Happy 4th!